The National Weather Service has issued both a High Wind and Flash Flood Watch for Wednesday afternoon and evening. 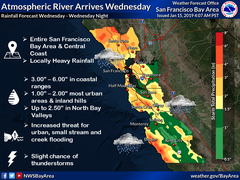 A strong storm system is expected to hit the East Bay during the afternoon on Wednesday and last into the evening. The storm will bring high winds and (in the San Ramon Valley) 1-2" of rainfall. In the event of any flooding, the Town of Danville offers a free sandbag station for residents. The station is located at our Maintenance Service Center, 1000 Sherburne Hills Rd. Sand, bags, and shovels are provided. Limit of 20 sandbags per household. Motorists are asked to use extra caution when the roads are wet. Give yourself extra time to reach your destination, and always have your headlights on when the windshield wipers are functioning.